It’s no exaggeration to say that Sik Silk has had one of the best-ever debuts of any brand in our 25 year history. Customers have fallen in love with its signature slim fit, sporty design touches and great value for money. What’s more, you can spend even less on new Sik Silk menswear with our offer code. 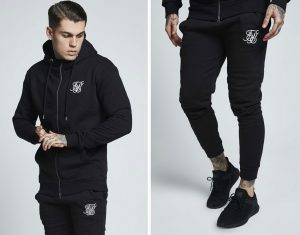 Just type in SIKSILK at online checkout to save 10% on everything in this blog! Sik Silk offer a whole host of matching garments, from full tracksuits to holiday beach-wear. 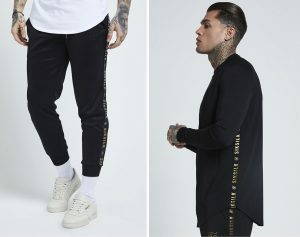 This new sweatshirt and joggers combo boasts a shimmering gold taping all the way down the sides of the outfit. The thin, lightweight sweat is ideal for everyday casual wear with a sporty twist. The matching joggers boast an adjustable drawstring and poly tricot fabric for maximum comfort, plus an eye-catching cuffed design. This is our second delivery of these garments — the first batch sold out within days, so be quick! This unique garment is unlike anything in our shop for Autumn Winter ’18 season with it’s thin ringer neck and sporty slim fit. Available in Urban Green and Navy, this new style is perfect for the cooler months to come, especially when layering under a sweatshirt or hoodie. Choose your ideal size from Small to X Large. We get a lot of gym fanatics at Apache, which is why this “Muscle” outfit has sold so well since arriving last month. The hoodie’s snug fit, soft cotton-rich jersey sweat and drawstring hood makes exceptionally comfortable to wear all year round. Lightly fleeced for warmth and durability, with an embroidered Sik Silk logo. Sik Silk have turned their hand to denim in the last year or so, and what a success they’ve made of it! 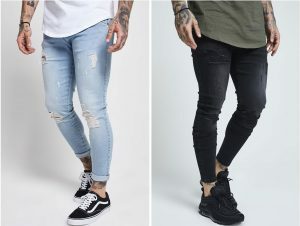 Even we weren’t expecting these stretchy, distressed jeans in Light Blue and Washed Black to be so popular, especially given the calibre of denim we have elsewhere in the store. Featuring a distinctive “low rise” design, concealed fly and distressed detailing, these jeans go well with a Sik Silk T-shirt. Fitting even the largest of thighs due to the stretch of the denim, this skinny fit jean is available in Small to Extra Large. Sik Silk’s T-shirts are at the very core of the brand’s image, with a fantastic collection available in our shop. This new arrival stands out with its branded Sik Silk taped cuffs, a striking look against the all-black design. 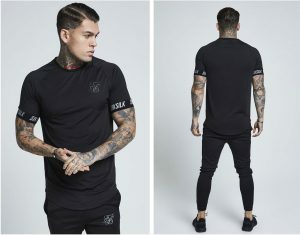 Like all Sik Silk T-shirts, there’s a signature curved hem and an embroidered chest logo. Also available in White. Keep your eyes peeled for other colours due to monthly arrivals featuring many other styles. 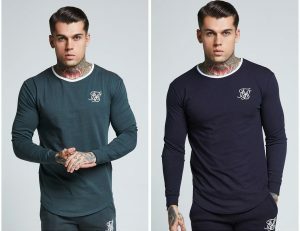 If you’re a Sik Silk fanatic, or fancy wearing their styles for the first time, use the code SIKSILK at online checkout to save 10% on everything!